Sound of Music – Sound of Austria? Work wise I was in the lovely Salzkammergut a lot the past month. Several Times in Mondsee, right next the infamous church which was used for the site of the wedding in the movie “Sound of Music”. Every time I was there, a horde of Americans and Asians would walk around the square in front of the church, take a look inside the church and fill up the memory cards of their digital cameras with the pictures of the same spots over and over again..
Today I was in St. Gilgen. I got there in the early morning, it was a sunny day and no wind, so the lake was crystal clear and the mountains mirrored in the lake. It was such a magnificent view that I decided to stop for a moment and enjoy the scenery for a while. That’s when the picture from above was taken. I even drove past that meadow where the shot for the infamous original movie poster was taken. Until I turned 20 I did not knew about the movie “Sound of Music” at all. I first heard about the movie when Americans started babbling about “Sound of Music” when I told them that I was from Austria. It’s funny that a movie that was shot in 1965 still brings Austria to the minds of even young people all over the world. My colleague from the local tourism office in St. Gilgen told me that one time, a group of Japanese tourists came to her office and asked her about the sights and the movie. Later the Japenese group would gather and sing the infamous “Edelweiss” song. Sound of Music is barely known in Austria and hardly ever shown on Austrian television. A lot of Austrians think that it portraits a cliché that is complete unfaithful to the real Austria. But without a doubt, Sound of Music has done Austria a great favor when it comes to the tourism industry and showing the world just how beautiful my home country really is. 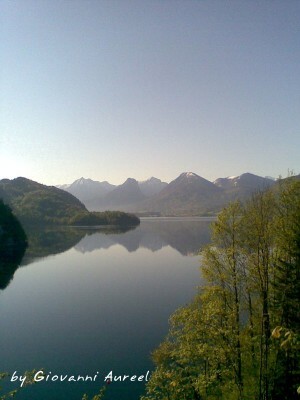 When I drove to St. Gilgen today and saw lake Wolfgangsee in front of me, I couldn’t help but smiley and think – maybe Austrians are not like in the movie, but at least the movie got the scenery right!